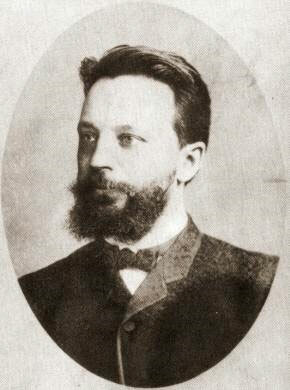 Mikhail Chigorin (1850-1908) was one of the founding fathers of Russian chess, and one of the great contemporaries of players like Steinitz, Lasker and Tarrasch. Little seems to be known, however, about his life outside chess. Alexander Kentler mentions that in a previous biographical article he had asked a rhetorical question about Chigorin’s two wives and daughter. He was surprised to receive a reply. In his recent column (which was pointed out to me by Arne Moll) Kentler relates how he was sent an article by Olga Kusakova-Chigorina, Chigorin’s daughter from his second marriage, for the New York-based “Novoye Russkoye Slovo”. The full text of the article, that Kentler says was never published in Russia, is given below. On the 12 January 1908, Old Style, in the town of Lublin, my father, Mikhail Ivanovich Chigorin, a famous Russian chess player, died. This St. Tatiana’s Day exactly half a century had passed since the day of his death. In all likelihood none of his contemporaries are alive, but many admirers of his talent are still scattered around the globe. And while it’s not too late I want to share some recollections of my father, not as a chess player (about Chigorin, the chess master, a lot has been written both in Russian and foreign chess literature). I want to tell you about him as a man and, primarily, to give a brief description of the last days of his life. He grew up as an orphan, raised in the Gatchina Orphanage. During the holidays he’d go to his two old aunts in St. Petersburg. In general, my father very rarely shared recollections from his childhood. He didn’t suffer from the urge to fantasise. He only laid out true facts and demanded that those around him gave brief and accurate replies. He always told me: “Think first and then answer concisely”. I knew that in talking to my father I had to be thoughtful, clear, accurate and only speak the truth. That’s how he’s been preserved for ever in my memories, wrapped up in that truth. As a man he was extremely nervous and irritable, and couldn’t stand stupidity in any of its forms. Above all he demanded logic from all around him. My father kept up an enormous correspondence on chess affairs in Russia and abroad. We saw him for days on end bent over his writing table responding to a pile of mail he’d received, while at night he’d be at his chess table, set up by the bed. He lived only through chess and for chess. There was always total silence in our apartment. If some object or other fell he would shudder, jump up and impulsively head for the scene, but before he got there he’d quickly go back and calm down. The only maid we had was one who never let plates or knives and so on fall out of her hands. In short, breaking the silence was considered a “crime” of sorts. I can only picture my father bent over the chess board or the writing table, or prancing with measured steps around the rooms with a rhythmical nodding of his head, his gaze focused, almost absent, not noticing anything around him. Chess combinations would often come to him suddenly. In such situations he could leave his guests at the dining table and go off to his study in order to set up the new arrangement of the pieces on the chess board. We ended up having to apologise to our guests, but the majority of them were chess players and admirers of my father, so it was taken with good grace and not held against him. It was worse when the three of us were having lunch, as there would be intervals not only between the dishes served, but also between the first and second spoonful of soup. It was rare for a dinner to pass without pauses. The maid would first be sent to inform him that the food was getting cold, then I’d go, and finally, mother herself. So that dinners often took place in a nervous atmosphere. My father was very picky about his food, and his greatest praise was the phrase: “Not bad, it’s edible.” The table had to be covered with a pristine white tablecloth and well served. The glass had to be delicate. In the flat there should be cleanliness and order. Our home life took place under the banner “all for chess”. It dominated everything: the apartment had a minimum of three chess tables, while the walls had portraits of Steinitz, Lasker, Pillsbury and other chess masters. In my father’s study there were two writing tables with piles of papers: letters and clippings from newspapers (the chess section). A glass case contained many books of chess literature. Beside the bed there was a small redwood table carved with the initials “M. Ch”. The postman told the servant: “What a strange master you have, why do they write so much to him?” Once a letter was delivered with the address on the envelope: “Chigorin, Russia” and it turned out that address was sufficient. In his absentmindedness he forgot my age (7-8 years old) and wanted to get me involved in secretarial work as soon as possible, ordering me to make cuttings from the chess sections of Russian and foreign newspapers. On many occasions I asked him to teach me to play chess, but he would always observe: “it’s not something for the female mind, lady”. Nevertheless, returning once from England where he’d visited a women’s chess club, he said: “Good stuff, those English women play decent chess”. He got to know chess himself while he was still a pupil at the Gatchina Orphanage. He was taught by his schoolteacher, while his first serious teacher was the well-known chess player Schiffers. Chigorin never worked and only contributed to a few newspapers and journals. When he was offered a job in one of the St. Petersburg banks he turned it down due to being overloaded with chess work. He personally considered it unacceptable to receive a salary for only being formally employed, although the Chigorins’ material situation wasn’t particularly brilliant. It was rumoured that my father made a fortune from tournaments, but that was a fairy tale. His talent was at its peak in the years 1891-95. Being a very nervous man, my father could never stand any smells and particularly the smell of cigars, while such serious opponents as Lasker, Steinitz and others wouldn’t let a cigar leave their mouths while they were playing. They enveloped my father in cigar smoke, which he couldn’t stand. He became stressed and made blunders. 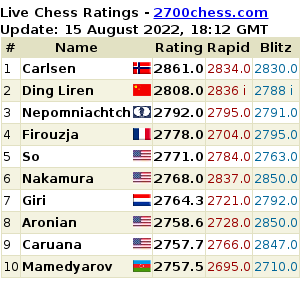 Someone wrote: there was the impression that Chigorin was almost too lazy to “seize the crown”. He wasn’t lazy, but given his nervousness the cigar smoke simply prevented him from concentrating in the manner required to work out combinations. Painfully sensitive, he had a “fever” for chess, while in the rest of his life he sought silence. For the sake of that silence we moved to Gatchina for two years as he wanted to complete one of his chess works, but living without Petersburg, without chess society and meetings was something he couldn’t do for more than two years. So we again returned to his native, beloved Petersburg. Having travelled to many countries and twice visited America, he was always glad to return, stating that there’s no city better than Petersburg. Chigorin’s internal makeup was of a man with a good heart and crystalline honesty, but with a difficult character. The defining feature of his nature was his anecdotal absent-mindedness: talking to someone he would often unexpectedly list some chess moves, which would confuse his interlocutor. He frequently looked for a missing piece which he turned out to be gripping in his own hand. From my earliest years I was told to look after him: had he forgotten to put on his tie, did he take someone else’s hat, and during a downpour did he take a walking stick instead of an umbrella? He often tried to put on two starched shirts at the same time, and not being able to fasten both collars he was all blood and thunder towards the washerwomen. Putting on two waistcoats was a common occurrence for him. Leaving the house with an umbrella he would rarely return with it, having lost it somewhere along the way, though soon afterwards he would bring five of them and put them all down carefully in the correct corner. At one time we lived on 84 Nevsky Prospekt, where there was a narrow pavement leading from the gate to the house (the same building housed the Chess Society). My father, meeting my mother on that narrow pavement, gallantly stepped aside, making way for her and completely failing to notice that it was his own wife. After the question: “What’s the name and patronymic of your wife?” he’d sink into thought and repeat a few times, “Anastasiya… Anastasiya…”, and confusedly declare: “But I can’t immediately recall the patronymic”. The examples of his absent-mindedness are legion. Work on chess really wore him out, but he couldn’t exist without it. He was also worn out by travelling abroad for chess tournaments, but if the interval between tournaments grew too great he’d start to get bored. I recall that once during the period we lived in Gatchina he returned from the station from St. Petersburg accompanied by some sort of dog, and at home there was a tournament invitation waiting for him. Chigorin was so excited that he ordered that the dog be allowed to stay and gave it the name “News”. 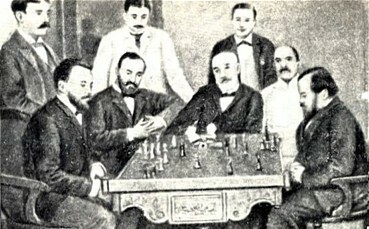 Among the chess players who visited us I remember Steinitz, Schiffers, General Kovanko, Prince Cantacuzène and others. In his later years my father began to get ill more and more often. At that time I was living in Lublin with the family of my mother’s sister and studying at the gymnasium there. My parents came to visit me and even thought about moving to Lublin. In 1907 my uncle died, and a year later my father arrived to visit us but was already very sick. He’d only just been discharged from hospital, it seems, as someone incurably ill (diabetes). He arrived on Christmas Eve [this may mean the Orthodox 6 January], lay down and never got up again. I took turns with my mother at keeping watch by his bedside. He would incessantly either move the pieces of his travelling chess set, or hallucinate. Once at night he called me and, pointing at his travelling chess set, told me: “burn this chess set immediately”. I was shocked – his favourite chess set, which he was never separated from – how could I suddenly burn it! His wish could only be carried out in the morning, when the stoves were lit. He became oblivious, fell into a delirium and spoke to someone invisible only about chess. Now we come to the last hours of his life: on 12 January, in the evening, the silence in the apartment was pierced by a soul-wrenching scream. We all rushed to the patient’s room. Mother calmed down father, while his eyes, frozen in horror, were fixed on the open door leading to the dark drawing room. It seems that he’d dreamt something, and the dream was connected to the door. When mother, having given him water, laid him down I tried to calm him down, saying: “It’ll all pass now”. But he responded in annoyance: “Yes, it’ll all pass when I die,” and helplessly waved his hand. Closing his eyes he sighed three times and then fell silent for good. The doctor who’d been called pronounced his death. It took place at 9:50 pm on St. Tatiana’s Day, 12 January. What his eyes saw in the dark drawing room will always remain a mystery. He was temporarily buried in the local Orthodox cemetery and then, before the First World War, and thanks to the efforts and troubles of St. Petersburg chess players, his body was moved to Petersburg, where for a second time it was consigned to the earth in the Novodevichy Cemetery. In the years that followed various individuals published recollections of M. I. Chigorin, but often inaccuracies would creep into them. Sometimes it was probably the result of false impressions, while at other times it was a product of the human imagination. Once I was sent a page torn out of some book or a small journal, where a certain V. Stachovich ends his article entitled, “From recollections of Chigorin”, with the words: “His, i.e. Chigorin’s personal life didn’t work out for him: he was a loner, although it appeared that he had a family and a daughter. He died among people he didn’t know, almost completely alone, forgotten by the organisation for which he’d worked so hard”. How untrue that all is everyone can see for themselves from my current recollections. My mother, after father’s death, often met with E. A. Znosko-Borovsky, who’s no longer with us. They would both only shake their heads at the fruits of such idle fancy. In 1928, after I’d already emigrated, I wrote to a companion from my childhood years – a cousin living in Leningrad, with a request to visit my father’s grave in the Novodevichy Cemetery. From the reply I received I learnt that she found the grave covered by dense nettles and neither a cross nor a monument. 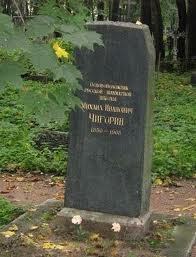 The gravedigger Andreev said that on one occasion the chess player Fedorov appeared and sought out where Chigorin’s grave should be according to the plan. He said he’d appeal to chess players and remind them of the grave of a man who should be dear to the whole chess world, and that it was essential to take measures to restore the grave. The measures were taken. In 1934 or 1935 I received a letter from Kharkov with a small printed page taken from some journal or book with a photograph of M. I. Chigorin’s grave. The grave has no cross and the burial mound is ringed by an elongated high wall, probably made of granite, with flowers placed in the middle and a suitable inscription on the gravestone. At the head of the grave there’s a bench and a stone chess table. Such was the state of the grave 20 years ago, but what happened to Petersburg, Petrograd, Leningrad and in particular to the Novodevichy Cemetery after the Second World War, I don’t know. And the thunder and storms died away. Is your gravestone still intact? Is overgrown by the grass of oblivion. Great memoir! Now I will look for books about Chigorin. Wikipedia lists one, by J. Adams, Mikhail Chigorin: The Creative Chess Genius. Caissa Editions. ISBN 0-939433-05-2. Thank you so much MISHANP! It’s nice to read of the “human” side of chess on occassion and remember that players are real people too. Awesome report, loving but honest and accurate as her Dad requested.